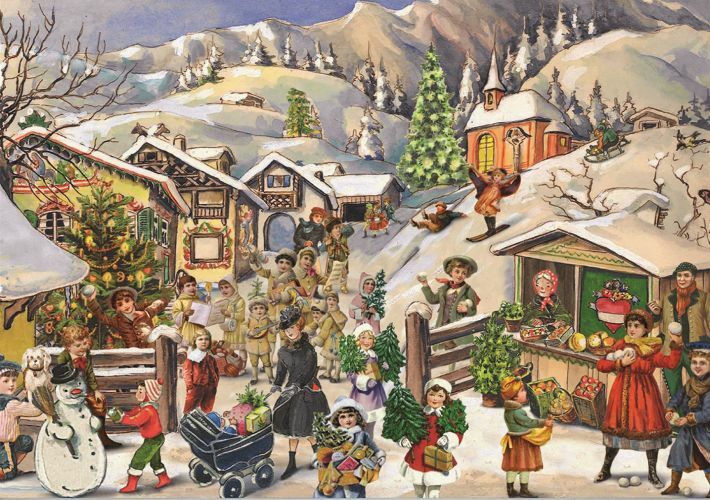 A newer, 19th century German tradition is that of setting up an Advent Calendar. Advent calendars are calendars, made mostly for children, to count down the days 'til Christmas, from 1 December to 24 December inclusive. For each of the twenty-four days on the calendar is either a "window" that reveals something when opened, or a pouch which might hold one or more of the following: a trinket, piece of candy, coin, picture, Bible verse, or even a "treasure hunt-like" instruction, for example, the parent might hide a small toy or Bible verse under the child's bed and leave an instruction behind the window or inside the pouch for that day that says, "Look under your bed and see what you can find." The children are only allowed to open one "window" or pouch on each day. Advent calendars can be store-bought, homemade, two dimensional, three dimensional, hung from walls or laid upon tables. They can be created from paper, cloth, wood or whatever your imagination dictates. They can be shaped into anything from Christmas trees to rectangles to elaborate houses, churches of village scenes. In elaborate Advent calendars, the windows might open up to reveal domestic scenes, people at Mass, a grocer selling fruit -- what have you. Some might have light, crepe paper windows that are illuminated when the calendar is set in front of a light source. One could easily make an Advent calendar by sewing 24 pouches onto a piece of fabric that can be hung on a wall -- perhaps 4 rows of 6 pouches. Each of the pieces of fabric used for the pouches could be embroidered or appliquéd with symbols of Christmas or the number of the days left until Christmas, starting with 24 and ending with 1. You can find some gorgeous, old-fashioned Advent Calendars here (offsite, will open in new browser window): http://www.sellmer-verlag.de/shop2/index.html.